First thought about the book - absolutely LOVED it. H.P. Mallory is becoming one of my favorite author through her writing. 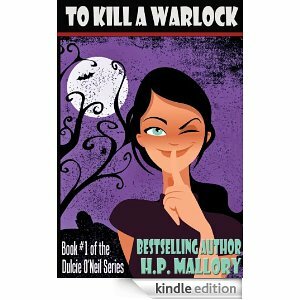 After finishing her both books of Jolie Wilkins series, I am still eager to get the third one in my hand however I am a greedy person so I grabbed the next best thing, To Kill a Warlock. This series is a lot like the Jolie Wilkins series's paranormal world. Dulcie O'Neil is a fairy regulator who is working undercover with a Loki to find the criminals who brought back a creature from the other world. Dulcie (I am not sure how it's pronounced though) is a fairy and part-time novel writer. Hot hunky men finds her very attractive and she finds a way to only have them as the fantasy hero of her books or sometimes her dreams.